Total oil production in North Dakota fell to 1041 kbo/d in March, a monthly drop of 70 kbo/d(!!). This was the largest month-on-month decline in the history of North Dakota. In the previous two updates, I noted that I expected declines of more than 20 kbo/d, which did not materialize at the time. With the decline in April, North Dakota production is now in the lower range of what I thought possible a couple of months ago. The declines where higher across the board for wells that started within the last year (new wells in April had an average performance). This may also be a partial explanation of why the DUC count has stayed on quite an elevated level. In April, my count of spudded, but not producing horizontal wells, went up from 978 to 993 (due to a larger than expected 59 new wells spudded, although this appears to be a monthly aberration). At the end of next week (around June 24), I plan to post another update on the Eagle Ford. I just listened to the latest NDIC webinar. Indeed completions were significantly hampered during April, and also road conditions severely limited truck loads. But Mr. Helms also mentioned that the drop probably was some catching up from the 2 earlier months. With completions running between 40-70 a month, the general trend (assuming well profiles don’t change by much) should still show a steady decline of around 10-20 kbo/d per month, although, as we’ve seen, there may be big monthly variations, including periods of small growth. Mr. Helms also changed his view, and now thinks it’s quite likely that the 1 million bo/d threshold will be breached this year. Enno, thank you, as always, for your good work. It appears the cows are headed to the barn, as we say in S. Texas, regarding US shale oil decline. An observation on drilled but uncompleted shale oil wells, please, from a long time oil and gas operator: it is impossible to distinguish between a well that has been drilled and is “awaiting completion services” and a well that has been temporarily abandoned for other reasons; Helms in N. Dakota does not know the difference and neither does any “analyst” or research company unless he, she or it is privy to the information contained in well file itself. Wells can be temporarily abandoned for a number of reasons, including mechanical, down-hole failures such as collapsed liners, failure to get casing run to the lateral toe, the lateral was steered out of zone…all kinds of bad things happen down hole when drilling a well that can, and do require suspending operations. Its dark down there and often hard to figure stuff out, trust me. There are geological reasons a well can be drilled and not completed, including bad interpretive data of the rock that is gleaned in drilling the lateral itself. Perhaps realized production from nearby wells on a multi-well pad simply does not warrant spending 4 1/2 million dollars to EVER complete that particular lateral. In the Bakken, with netback oil at about $18.00 per barrel at the wellhead, it will require 250,000 BO just to payback frac’ing costs, not to mention another 250,000 BO to pay back drilling costs. A 500,000 BO EUR in the Bakken is a novelty, I believe. A well can be TA’d (temporarily abandoned) awaiting sidetracking, or re-drilling a new lateral into a shallower horizon; I suspect that is why we see more DUC wells in the Permian. Those wells are simply suspended awaiting more money, and a drilling rig, to re-drill a new lateral into another multiple stacked horizon, for instance say from the Wolfcamp D to the Wolfcamp A. The Eagle Ford has stacked potential, even the Bakken. Wells can also be TA’d awaiting deepening. A drilled but uncompleted well does NOT earn acreage in mineral leases that require continuous drilling, nor do DUC wells hold acreage by production (HBP). Only production, in paying quantities, earns or holds acreage. Something is fishy, in my opinion, about all this DUC stuff. If in your excellent data you are seeing more recently drilled DUC wells being completed, and the older ones are getting left on the shelf; that’s not a good sign. They are getting left behind for reasons other than hoping for higher oil prices. Good comment Mike, but it isn’t quite true in ND that you can’t tell what will never be completed and what is awaiting completion. They also have a “PNC” designation – plugged, not completed – as well as TA and PNA (temp abandoned and producer now abandoned). PNC = DUC. You are right, though, that TA could also be a DUC. Sorry for the alphabet soup. Thanks a lot for your comprehensive comment! The total # of “spudded & not producing” wells in ND dropped quite rapidly from over 1200 by the end of 2014, to below 1000 by mid 2015, after which the decline surprisingly stopped. As the early decline showed, with a drop in prices it makes much more sense to complete wells, than drilling new ones (esp given the general lack of cash flow). Of course there are other considerations as well (HBP, a few operators trying to benefit from lower costs), but you would expect those to dissipate over time. In April, only 11 out of 44 wells were starting production, that were spud more than a year earlier, even though there were 300 of those. The bbls to pay back drilling costs are irrelevant when deciding if one should TA or not (sunk cost). Just the completion cost versus bbls (and opex) is relevant after the well is drilled. Nony: It is important, at least to me, to be able to differentiate between drilled wells voluntarily awaiting completion, and TA’d wells requiring extensive re-capitalization. Let me be very clear: I think everything about the shale oil, and shale gas industry is “fishy.” You must have still been riding your little bicycle around the block when the shale gas industry got caught with its pants down around its knees 15 years ago with over inflated EUR’s and SEC violations regarding reserve estimates. The exact same thing is happening now with the shale oil industry. If I read it on the internet, I don’t automatically believe it is true. That might be where we split the sheets, you and me. I don’t believe in the shale oil industry’s EUR’s, nor its PDP, PUD, PDNP, DUC’s, EBITDA BS; nothing, nada, zilch. 0. What I DO believe is the 240 plus billion dollars it owes, and can’t pay back, and the billions of dollars of money it lost last year, going to tens of billions of dollars in losses this year. Now that we have that out of the way, there is no reason for you to insult me, or use Enno’s blog to pick a fight with me, or anybody else, to prove your point, whatever that is. This is not peakoil.com. I do, however, wish to thank you for this profound statement: “The bbls. to pay back drilling costs are irrelevant when deciding if one should TA or not (sunk cost). Just the completion cost versus bbls (and opex) is relevant after the well is drilled.” After 55 years and over 300 oil and natural gas wells drilled and completed with my own money, it just goes to show that one is never too old to learn something new. Sunk costs, when you are spending your own money, is never a “fallacy,” so I thought. Maybe there is still time for me to grow up and be like the shale oil industry and I am going to really look into that. Enno, I am very sorry. I won’t cause trouble again. Holler if I can hep you. The sunk cost fallacy applies whether you are investing your own money or someone else’s. It is not an oil/gas concept but a business concept. Applies in real estate, manufacturing, oil, software, pharma, etc. Yes, the condition of a well (e.g. if we have info from logging while drilling) does affect the decision to complete. However the previous spend on drilling the well is not relevant to the current decision to complete or not. I am aware of the sunk-cost fallacy. However, as Mike is clearly very aware of, it is not a sound business decision to decide on a capital investment of e.g. completing a well, with the goal just to earn that latter investment back. There are quite some risks involved in E&P, among which just one of them is price risk, and a business can over the long term only survive if in general it earns plenty over the costs made. Furthermore, there is a major difference between the viewpoint of the management of a public company, and the viewpoint of investors in those companies. Similarly as a private owner, the latter group should care about the debts incurred, and the costs of wrong business decisions made in the past. I think the fishy aspect that Mike refers to is that the DUC count appears high in all the basins, but it may be (and, as he says, this is hard to verify) that a significant portion of these wells will not be brought online as quickly, as appears to be often assumed. Monitoring the age of the DUCs, and the quality of the DUCs that were brought online hopefully may help to shine some light on this issue. Coming from a very experienced operator as Mike, this “hunch” deserves more attention. As I mentioned before, please don’t mix discussions elsewhere with the ones here. You give the appearance of calling certain statements biased, which is an ad-hominem. I will not tolerate personal attacks here, so this is the last warning. I support critical evaluation of the data and of different views (which you have also shown), as I care about figuring out the truth. 1. Yeah, you got me. I will try to keep the discussions on the post. I can push back on faulty assumptions within that scope. 3. Just listened to the webinar also. Some good tidbits in there. Just my monthly 2c worth on GORs. Oil price up, cash flows more comfortable, Oil production down a whopper, GOR also down and against the trend! I wonder if someone fiddled with those chokes just a little to more conservative settings? Haven’t seen any clear evidence of open choke manipulation. You’ve mentioned it a couple times on this site, but other than a suspicion, haven’t given any evidence of it. FWIW, Helms even makes a comment about an economic decision that goes the opposite direction (during low price environment) which is to shut in production–for example in the webinar, he talks about decisions to bring some marginal wells back on line with price in the 40s. And in the Marcellus actual shutins are very well documented–despite this Marcellus production grew last couple years of low price environment. Also it is a documented fact that the Bakken is deeper in the center of the basin (it is bowl shaped) and that it has a higher GOR there. And that drilling has moved into the center of the basin. One thing I noticed (best viewed on the “Well Quality” tab, and then grouping by month or “quarter of first flow”, you can use the filters to just look at wells that started first flow in 2014-2016), is that in the 2nd half of 2015, wells displayed quite a better initial production than earlier wells; however, since 2015-12 that trend has, so far, been reversed (wells are performing very similar to 2014/2015 1H wells). I find it quite striking how little effect high-grading appears to have had. When I get some time, I will have a good at the different companies and age of wells, but with a 70k drop, there must be some sub group of wells that has taken a major hit. 1. It seems to me that for a while there has been this issue of competing effects causing a standoff in well quality. *Drilling out the MB and moving the TF. Having a standoff now, doesn’t mean it will last forever. Just I think we have this peculiar effect where someone might have expected the wells to get worse (but then they didn’t) or someone else might tout the improvements in technology, broadly defined to include incremental geological learning and even “practice” of work crews, (but then average cums have barely moved). Tool, I understand the “burning the furniture” rationale. I just don’t see any reported evidence of it. I think you need more than a hunch to feel so confident. For the last 12 months, oil production in the Bakken has held up better than expected. Early last year, it was estimated by numerous number crunchers, that around 120 wells were needed to the keep the Bakken at a constant number. Last month (March numbers) there were only 60 wells completed and production only dropped 10k bopd. All through this time, there was an increasing GOR. This month, ( April numbers) the was 40 wells completed, with a 70k bopd drop in production. Strangely enough, the GOR which had been trending up for a year, suddenly changed course. A 20 less wells completed can not account for this 60k bopd loss. So there has to be something else going on. All your reasons given for changing the rate of production may all be valid, but what changed in April? Certainly not drilling or completion rates or a major shift it drilling locations. Something on a shorter term basis, has taken place. The change in direction of the GOR is a big indicator in my eyes. The last and final step will be if any of the wells are permanently damaged? Obviously, we will have to wait and see the numbers, if this is the case. What I find a little baffling, is your total un-acceptance of the idea that oil producers would manipulate choke settings/pumping rates for their short term survival. Any animal caught in a trap will do anything to survive. The shale oil industry is just following their animal instincts to fight and survive today and be able to fight another day. An example the opposite direction of PXD is EOG in the Bakken where they were in a great spot early and drilled it out. Have previously linked to a video panel discussion noting this as early as 2012.
a. The first thing is it is important to not make an implicit or explicit generalization to shale in general, based on one basin. b. The second thing is that comparisons like this may make it possible to try to isolate some of the competing variables. The scary part of your graphs is the almost vertical slope of the decline of the production of the legacy wells. Do you guys agree that water might be making the difference in Permian to that in Bakken? Appreciate your feedback Nuassembly, and I welcome if you and others use the data here for more in-depth analyses. – I am not sure how much difference in water production there is between the states. Unfortunately, most states don’t report this on a detailed enough level (incl Texas). – I recommend using the filters in the “Well quality” tab to zoom into the exact data set you want to have. E.g., while it is useful to compare well profiles between the basins, if there are large changes over time, the impact of that is not visible. By focussing for example on wells that started in a number of years, the effect of these changes can be reduced somewhat. E.g., you might also want to compare the well quality between the basins, based on wells that started, say, since 2013). Great work as always. One suggestion for an improvement though. In well quality, would it be possible to set up a ‘benchmark’ graph, like the one attached to the comment? 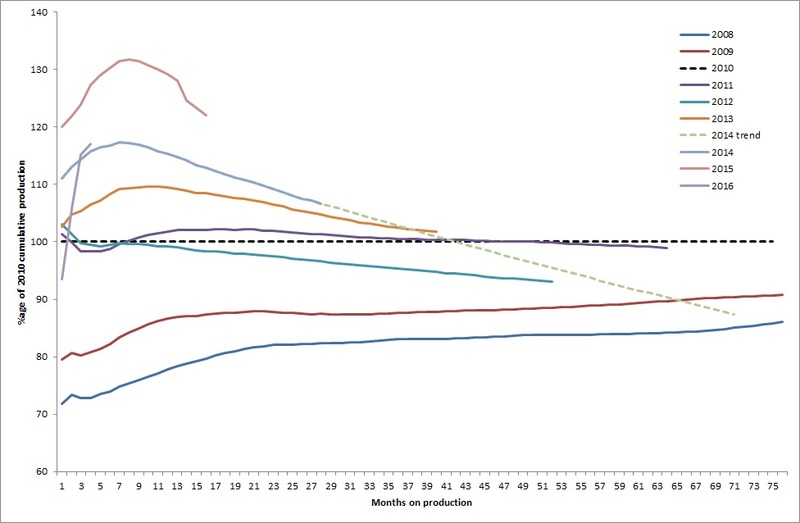 It shows average cumulative production by month of production for each cohort, benchmarked in this case to wells from 2010. The y axis is in percentage difference terms – so in month 7, 2015 wells were 31% above cumulative production for 2010 wells at the same time in their life, but only 20% above by month 17. 2016 wells look low in the first few months, but this will be skewed by confidential wells, which I haven’t included (even though, as I’m sure you know, you could by using production runs). I find it is a great way to show the increased decline rate for the “higher producing” new wells, and the fact that initial production gains simply don’t hold across the well’s life. That’s a very nice graph indeed. There are lots of insights to show, and your graph is an excellent example. I have over 30 overviews, which I regularly look at. I will probably make more available in the future, but will never cover everything. Therefore, I hope you can keep on sharing your work as well! Greetings. As always, I think the work you do is great. Thanks for the effort. I recently got a tablet that is enabling me to see things better than my smart phone screen… so I thought I’d do a little research. Enno … please … the bump up in older well’s output related to nearby fracs is so obvious that I find it hilarious. While using the individual well profiles via subscription is the way to go, efficiency-wise, I’ve come up with a half-assed workable system just using the monthly DMR production figures. I just ran through a truncated history of permit #20202, Oasis’ early well in the Alger field, and the ‘story’ is chrystal clear. I find it somewhat curious that with all the time you have put in, with the implications of this ongoing, enhanced output so significant, that you have seemingly dismissed looking at this more granularly and presenting the obvious conclusions on your blog … backed up, I may add for Nony’s possible edification, by the amazing visuals and graphics that you currently display. Me?, I’m gonna spend a few more minutes tracking down some ‘halos’. They’re all over the place. Thanks for your kind remarks. I’m happy you enjoy it, and indeed I think the presentations are best viewed on a tablet (or laptop/desktop). I spent most of the efforts on presenting all the data here, and not very much time actually on analyzing the data more closely. I typically highlight a few findings, but I’m sure there are all kinds of interesting nuggets buried in here somewhere, and I like it if people find those, and report them. There is one case I still sometimes follow (XTO wells in Bear Creek), which indeed showed quite an effect. But it’s still hard for me to see that, on the aggregate, this effect seems to be clearly noticeable. Older wells are on average still declining on quite a pace (+-10% per year), and I’ve not even removed the older wells from this data that have been refracked (they typically have a very large effect on the average production, given that most other wells from that age produce very little). Then you can see more easily the production profiles of all vintages, during the last 1.5 year. I don’t see strong evidence here for much better performance of older wells. I would therefore conclude for now that the halo effect may be significant on an individual well basis, but that on average, the effect is quite minor. The use of the Gis map is crucial as the proximity of the wells plays a HUGE role in the older well’s increase. A reading of the newer well’s file – available via the subscription – would be helpful as it contains the amount of fluid used in the new well”s frac. More fluid = more induced, wider matrix pressure increase. The biggest reason explaining why you do not see this effect on more older wells is their spacial relationship to the newer wells. L follow up tonight or tomorrow with specifics. Having trouble with new device. Apologies. Will continue tomorrow. 100% of time, older wells increase output to varying degrees depending on their closeness to New well. There is a jump in production from nearby wells after fracking because the wells got shut in during the frack and then were opened. But this is no different than what you get when running a test. Or if you shut a well in for maintenance and then re-open it. Saying something as strong as possible (“so obvious”) is not any form of even weak proof. This is something that Bruce Oksol has been touting for years, but all aenecdotal. No E&P, academic, service company, analyst, or reporter has come out and said there is a halo effect or even that there might be. And there has been huge reporting and claims on everything else (refracs, DUCs, choking, shutins, slickwater, bigger fracs, etc.) If there were something to the halo effect, we would have heard about it. Oksol has blogged about it for 2 years. It’s not some super secret idea.